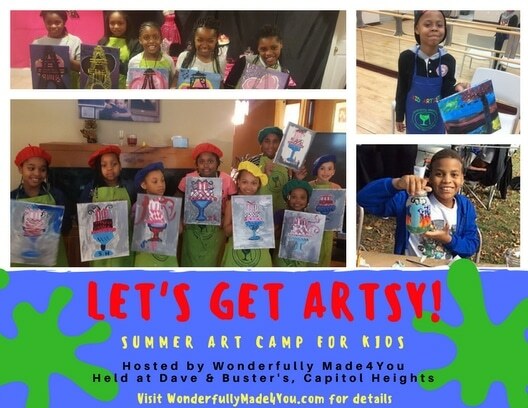 Wonderfully Made4You Art Camp! This is a great place for kids to enjoy their summer by express themselves and bring out their own creativity on canvas, glass, fabric and other mediums. In addition to fun play time at every kids favorite place Dave & Buster’s! Each week will conclude with an exhibit and ceremony, including light refreshments, showcasing your child’s art projects. Please read this section carefully before completing your application. PLEASE REGISTER EARLY. Applications are processed on a first-come basis, and enrollment is limited in all summer programs. Your Enrollment Application does not guarantee space in a camp. Your registration is not complete until you have received confirmation from us. Please make a copy of your completed paper Enrollment Application before emailing or mailing it our Office to keep track of your enrollment dates. PAYMENT: FULL PAYMENT IS DUE BY JUNE 29th . Payment by Visa, MasterCard, Discover or American Express is accepted online only: www.WonderfullyMade4You.com. Paper checks, made payable to Wonderfully Made4You, may be mailed to our Office at the address 6714 Ingraham Street, Riverdale, MD 20743. POST-MARKED BY JUNE 29, 2018. The camper will not be allowed to begin the Summer Art Camp program unless the camp fee and application have been paid in full. The parent/guardian completing/signing the Camper Health History form and return prior to first day of camp. RETURNED CHECK FEE: There will be a $30 charge for each check returned by the bank. In ALL cases, the enrollment change fee is non-refundable and non-transferable. ALL charges are calculated by the week. If at any time prior to attendance an applicant withdraws from ALL Summer Programs, the amount paid for the program(s) less the enrollment change fee will be refunded. The enrollment change fee will be refunded only if camp is cancelled due to the fault of Wonderfully Made4You. Refunds will not be granted for individual days missed (i.e. for illness, vacation, etc.). Refunds will not be offered if camp is closed due to weather conditions, power outages, or for any reason that would prohibit camp from operating safely. When an applicant withdraws from any program(s), the applicable refund will be issued AFTER JULY 31, 2018. The Director reserves the right to request the immediate withdrawal of any participant whose behavior is detrimental to the program. The participant will be charged for the entire week in which the withdrawal occurs, but no cancellation fee will be charged. Wonderfully Made4You Art Camp is not responsible for loss of or damage to personal property during the operation of the program. Valuables, such as jewelry and electronics, should not be brought to camp. FOOD: Lunch with beverage and a snack with beverage will be provided for all full-day campers, and the cost is included in the weekly fee. Food items have been pre-selected. The menu will be provide to parents once enrolled. No outside snacks and food is allow to be bought on the campus. EQUIPMENT AND SUPPLIES: Will be provide by us, your child don’t have to bring anything to the camp, we will provide everything that’s needed. Wonderfully Made4You Art Camp reserves the right to require additional information, following receipt of the health form (which will be provided once your child is enrolled), that may cause the Camp to specify terms for acceptance or deny admission if the Wonderfully Made4You Art Camp program determines that it cannot reasonably meet the needs of an individual camper. In this case, the enrollment change fee will be refunded. Wonderfully Made4You Art Camp believes that a positive working relationship between the Camp staff and the child and the child’s parents or guardians is essential. Therefore, the Camp reserves the right to dismiss or not re-enroll the child if the Camp concludes, in its sole discretion, that the actions of a parent or guardian make such a positive relationship unnecessarily difficult, interfere with the Camp’s operation, are not supportive of the Camp’s goals, or adversely affect the reputation of the Camp. The Camp reserves the right to dismiss or not re-enroll the child if the School concludes, in its sole discretion, that the needs or demands made by or on behalf of the child or the child’s parents or guardians place undue burden on the resources of the Camp. Wonderfully Made4You Art Camp routinely records and photographs events, achievements and arts for use in its own publications and on the Wonderfully Made4You websites and official social media outlets. When publicizing students’ achievements on the Wonderfully Made4You websites or social media sites, or when such news is forwarded to media, campers’ first and last names will not be used to identify the camper. Please see “Camper Waiver and Release” section on the Enrollment Application to grant or deny permission for the School to use photos of your camper.